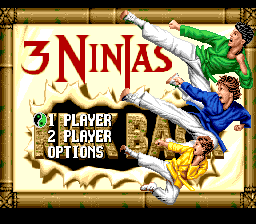 3 Ninjas Kick Back is a platforming game developed by Malibu Interactive and published by Sony Imagesoft in 1994 for the Super NES and Sega Genesis (ported by Psygnosis) exclusively in the US to tie in with the 1994 film of the same name. It was bundled with Hook in the 3 Ninjas Kick Back / Hook compilation for the Sega Mega-CD. You play as one of the three main characters in the film. Your goal regardless of which character you choose is to assist an old samurai in retrieving a prized dagger from an old rival. To do so, you must complete a series of levels, each requiring you to complete a certain task (sometimes with a time limit) before continuing. shoots your sword (which may have an item attached to it, such as spreader bullets), jumps, and uses a special weapon found throughout the levels. while in midair kicks. Hold to crouch; moving left/right while crouching will have you crawl and you do not need to keep held while you crawl, so you will stand up once you let go of the D-pad. Main article: 3 Ninjas Kick Back/Magazine articles.